In an era of HD remasters and rereleases, Capcom is bringing a beloved visual novel adventure trilogy to the Nintendo Switch with new HD visuals and other improvements with the release of Phoenix Wright: Ace Attorney Trilogy. Phoenix Wright: Ace Attorney first debuted in western markets in 2005 on the Nintendo DS. Thanks to the DS’ touch-screen and casual appeal, this visual novel adventure game felt right at home and quickly gained popularity amongst the handheld’s audience. In the subsequent years, Capcom would release sequels – Justice for All and Trials and Tribulations, which continued to follow the law career of Phoenix Wright. 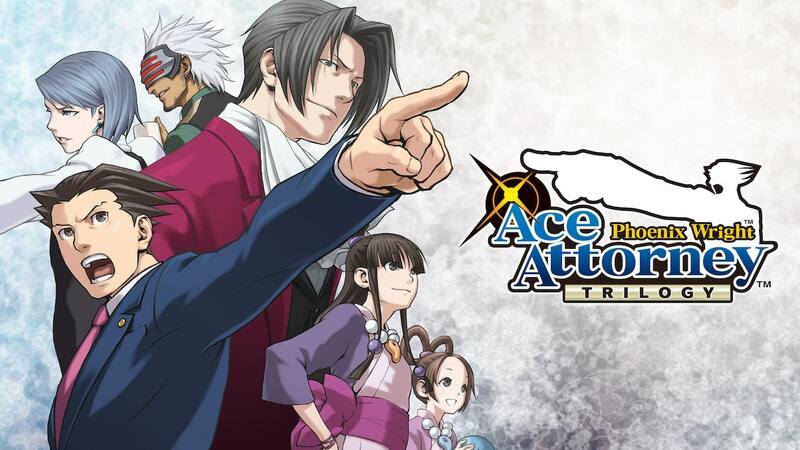 Thanks to a lively cast of characters, interesting storylines, and exciting courtroom gameplay, the trilogy is every bit as memorable and entertaining as you remember. Capcom has issued gamers a court summons and it is your civic duty to appear. Court is now in session. If you are unfamiliar with both Phoenix Wright and the Ace Attorney trilogy, now is the time to rectify that social injustice. Priced at just £29.99 ($29.99), the Phoenix Wright: Ace Attorney Trilogy offers tremendous value and is positioned in impulse buy territory. Featuring three games and dozens of hours of content, the Phoenix Wright: Ace Attorney Trilogy is a treat for anyone that enjoys a good interactive story, watches a lot of Law & Order, or may one day become an attorney. The first game of the trilogy – aptly named Phoenix Wright: Ace Attorney, begins with Phoenix Wright preparing for his first case. The rookie lawyer is nervous and unsure about proper courtroom etiquette, which plays to the game’s strengths as the first case serves as a tutorial for the player. Over the course of the trilogy, both the player and Phoenix Wright will grow into a confident and accomplished attorney that can handle any case they are presented with. What makes the Phoenix Wright: Ace Attorney Trilogy such an immersive experience is how the game is presented in two key points of view: investigation and trial. While outside the courtroom, you are given the opportunity to comb crime scenes for clues and new evidence that may favor your client and lead to the conviction of the true perpetrator. Players can use the Nintendo Switch touch-screen to examine points of interest or exploit a new addition – a magnifying glass that will appear whenever you are on an area that can be further inspected. This feature allows the game to keep a brisk pace and prevents investigation sequences from becoming too drawn-out. Once you have successfully scoured a crime scene for clues and evidence, you will find yourself in the courtroom to present your evidence and defend your client. This is where the game shows a lot of its personality, as characters are theatric and each case is loaded with exaggerated drama. During trial segments, you will hear testimony and then be given a chance to cross-examine the witness. It is during the cross-examination that you’ll be able to press the witness and have them expand on their testimony to discover discrepancies, or object and present evidence that contradicts the statements that have been provided. Carefully skimming through testimony, consulting your collection of evidence and exposing a false statement is exciting and rewarding. The larger-than-life reactions of the characters getting caught in a lie results in some comedic relief, but will also have you feeling self-satisfied for exposing them for the frauds they are. The court hearings aren’t as simple as being able to object and try every piece of evidence until the right one sticks. If you call for an objection and fail to produce evidence that clearly illustrates an inconsistency, you will be punished by the judge. Failure to produce viable evidence consistently during the hearing will result in the case being thrown out. Read the testimony, press the witness when in doubt, assess the evidence, and you’ll find what you need to expose the fib. Capcom didn’t take any shortcuts with this release of the Phoenix Wright: Ace Attorney Trilogy when it comes to the new HD visuals. The characters are expressive, and the HD animation looks great in both docked and handheld mode. Furthermore, the soundtrack is energetic and accurately depicts the events transpiring in the game. Presentation has always been a highlight of the Ace Attorney series and that fact remains true with this trilogy collection. Those familiar with the original releases won’t find any new content here, though. Some quality of life enhancements has been made – like the magnifying glass, but the only other notable addition is the inclusion of multiple save files. Touch-screen or standard control support is available to players. Offering touch-screen support helps to replicate the Nintendo DS experience and gives the collection a touch of nostalgia for the original release. Phoenix Wright: Ace Attorney Trilogy has been charged on the counts of – highly entertaining and delivering players with a trio of excellent games. On these charges, the court finds the Phoenix Wright: Ace Attorney Trilogy guilty. Capcom has also been found guilty on the lesser charge of providing players with three games for an affordable price and for offering gamers a great value. The judge has sentenced the Phoenix Wright: Ace Attorney Trilogy to be classified as one of the Switch’s best early 2019 releases.